How To Do Art With Networks was a one-day-open market with workshops, lectures and performances that explored how networks are art. Curated by Annet Dekker, the event was built-up around artist Martine Neddam’s research for LAPS, the Research Institute for Art in Public Space of the Rietveld Academie. Several existing net-art-works served as catalysts allowing the public-participants an opportunity to share experiences and to experiment with platforms, tools, and media. Guest practitioners were Robert Sakrowski, Katrina Sluis, Anne Roquigny, Martine Neddam, Michael Murtaugh and Aymeric Mansoux. Networks operate: they are decentralised and create connections. As such, their organisational structure distinguishes itself from the classic hierarchical systems. In line with this How To Do Art With Networks reconsidered the conventional form of the conference format and instead created the event as a “one-day-open market”. The venue was set-up as a workshop space. 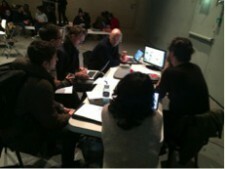 At different tables, participants could experiment with a variety of online tools developed by artists and curators. 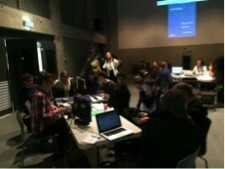 The audience was invited to examine these art-net-works and share their experiences with the artists and programmers. The research approach was to gain knowledge by doing. Art-in-networks were tested, new solutions were found and blind spots were identified. The open format leads to a wide range of questions, including: What are relevant practices for collaborative authorship? How can one maintain all the different elements within a net-art-work (archive, user interface, code, moderation, etc.)? 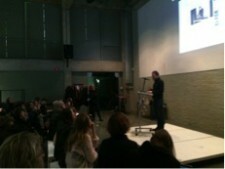 On different levels, the event prepared the ground for further developments for art within networks. How To Do Art With Networks was organised to celebrate the launch of MyDesktopLife, a web-editing project initiated by artist Martine Neddam. It was Neddam’s aim to not only share the tool with others, but also to present it along side as part of a network of artists that were also interested in sharing their tools. The selected projects could all be seen as art-in-networks. 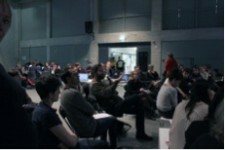 In the introduction to the event, a network was described as “linked structures and distribution systems that connect traces, projects and people”. As such these net-art-works function as online tools and the audience is not only invited to interact with the different artworks, but to use the tools for their own purposes and give suggestions for further developments. Most of these tools are available for free on the Web. During How To Do Art With Networks the net-art-works were not only presented, but more importantly, they all acted as catalysts for exploring different perspectives and potentials for further development. The remainder of this report summarises some of the insightful reflections that were shared during the day. Art historian and curator Robert Sakrowski traced the tradition of the grid as a form to work with a quantity of information and comparative viewings. To expand on the traditional concept of the grid, which is usually understood as a collection of static pictures, Swarovski developed a tool that applies the grid to moving images. The online tool Gridr.org makes it possible to browse through different screens at the same time. It offers opportunities to not only compare images, but also, to rethink narrative structures. 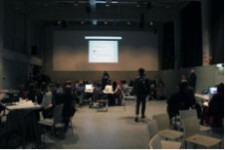 Gridr.org can also be used in multiple contexts: curating, creating soundscapes, or live performances. Katrina Sluis reflected on the functioning of art in networks in her presentation “Image Exhaust: Pictures vs. Imaging Systems”. From her experience as a curator at The Photographers‘ Gallery (London) she analysed the relationship between photography and fine art and in particular how the value of photography changed with the emergence of digital culture. With the merging of photography and the Web, the image was no longer unique and singular, but absorbed in a stream of data that is continuously circulating. This raised new questions about how to comprehend these ‘networked images’ and how to renegotiate our relationships with them. 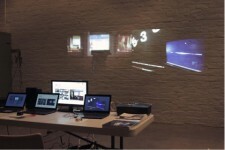 The network is an apparatus that connects people, inside and outside the gallery, but also on the Web. Sluis emphasised the importance of approaching the digital not only as a tool, but also as a knowledge system and culture. 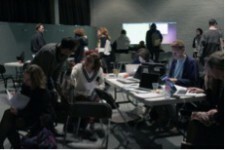 Media arts curator Anna Roquigny and programmer James Hudson presented the online tool WJ-S, which they described as “a mix of the Internet in real time”. Within a collaborative playlist multiple users can add and share their online content (by a simple drag and drop mechanism). The tool was created in order to translate individual or collective surfing towards a physical environment (gallery, conference, festival). This translation from the online towards the offline space turns browsing into a spectacle. Events were organised all over the world in collaboration with artists, curators and participants. All were invited to play and perform with this tool. These events were further used to inform participants on how to use the software and to share experiences in order to improve it. The web-editing software MyDesktopLife originated from Martine Neddam’s artistic practice. Neddam is a pioneer of Net Art. She has experienced how personal creations on the Web are increasingly restricted by formats used in websites like Word Press and Facebook. The tool “MyDesktopLife” gives some freedom back to the users by offering possibilities for web editing, such as the creation of layered images and narrative structures within the browser. The prototype of MyDesktopLife was supported by a research grant from ZKM (Zentrum für Kunst und Medientechnologie, in Karlsruhe). The next step is to share this tool, for which a content management system (CMS) has been made. Anyone can register, use the prototype and become part of the community, which in turn, will contribute to further developing the tool. Artist Harm van den Dorpel is rethinking the structures of our (social) databases. Delinear.info breaks with the linear and chronological organisation of most social media platforms. Users can follow each other and and can expand upon each other’s thoughts. Again, the tool came about through van der Dorpel’s own artistic practice, as he could not find a suitable tool for storing his collection of images, ideas and texts. Jan Robert Leegte described Delinear.info as a “multi user image building site”. It is a live database, free and dynamic, and most importantly, connects different knowledge areas and people. In this way, it functions like an ecosystem. Within the database there is no distinction between content and navigation. Michael Murtaugh is a member of Constant Art & Media in Brussels and co-initiator of their project Active Archives, which is a project that aims to create a free software platform to connect various (institutional) practices. Constant critically reflects on which software cultural institutions use and what implications that has, in terms of authorship, copyrights, etc. Murtaugh offered valuable reflections on online collaborations and how we can reclaim the tools we use such collaborations rely on. Among others he creates his own local networks with PirateBox. A PirateBox is a portable electronic device for storing information and for creating a wireless network that allows users who are connected to share files anonymously and locally. This device is disconnected from the Internet. For the conference Murtaugh created a hotspot with a dead drop interface, which could be used as an intranet within the Rietveld building. 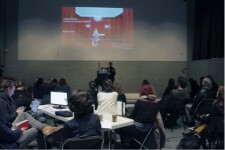 Artist, musician and media researcher Aymeric Mansoux shared his reflections on the theme How to do art with networks and suggested the rephrasing “How to do art within networks?”. He emphasised that networks are not only about “making” something, but also about the relationships between humans and non-humans, and about the power struggle between different rules. He then went on to examine how art was made within or outside existing systems. Artists have always been forced to develop their own systems, but is it possible to truly escape the existing ones? He took the manifesto of the art movement “Copyleft” as an example of how escaping a system is extremely difficult, especially since we do not have a relationship with one, but many systems. How To Do Art With Networks is curated by Annet Dekker and co-organized by Martine Neddam. Production support was done by Sietske Roorda (LAPS). Alina Lupu and Vitya Glushchenko were responsible for all the designs. How To Do Art With Networks has been made possible thanks to the generous support of Lectoraat Art & Public Space (LAPS). My Desktop Life has been made possible by a grant from the Creative Industries Fund NL, Rotterdam.